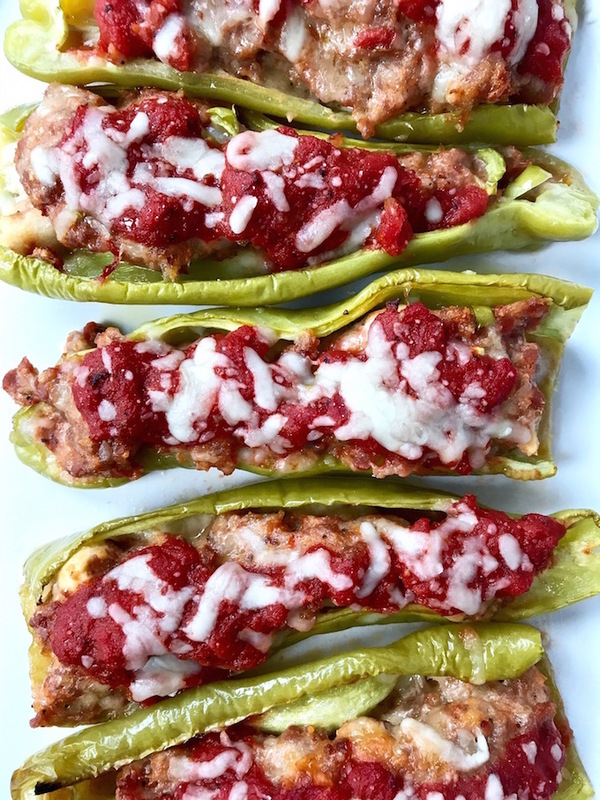 Stuffed Peppers with Sausage and Mozzarella are loaded with flavor yet require little effort to prepare. Mix the ingredients in the bowl, stuff the peppers, top with sauce, sprinkle with cheese, bake, and serve. 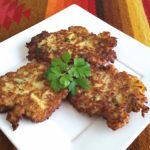 Part of my KISS recipes – Keep It Short Simple. Ever have one of those days where you just don’t want to cook? Even me, a person who loves to cook, has some of those days. My husband would suggest take out, but take out food isn’t my preference. I want a great meal, but with little effort. I was at the market and the produce clerk was stacking beautiful red, yellow, and orange bell peppers. They were perfect with their skin tight and taut – the kind Hollywood actors pay so much money to have – except these were natural. I bought a few of each color. I also saw some fresh Italian green peppers and added them to the cart. 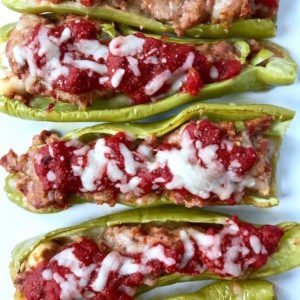 I knew these would be the perfect stuffed with sausage and cheese. As I passed by the bakery, I could smell the aroma of freshly baked Italian bread. I grabbed a loaf knowing it would be perfect with dinner, but also as an ingredient for my peppers. 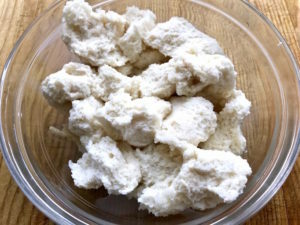 Soaking some bread with milk and adding to the sausage mixture would soften the filling. This recipe requires no sautéing of vegetables. 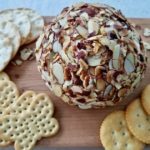 All you need is a big mixing bowl (affiliate link), a cutting board, a good sharp knife, and a baking sheet lined with foil. Guess what? The sauce is no cook too. 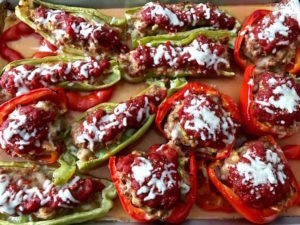 The sauce will cook in the oven when baking the peppers. No chopping, no sautéing. Easy. Tear the bread up in pieces then place in a bowl. Pour milk over bread and let it soak in. Combine the filling ingredients in a large bowl. Slice the tops off the peppers and cut each pepper in half lengthwise. Scoop out the seeds and pull off the white ribs. Don’t discard the tops. Place them in the pan under the peppers and they will soften as they cook. You can also chop them fine and sprinkle on top of the peppers prior to baking. It adds a bit of flavor and color to the tops. 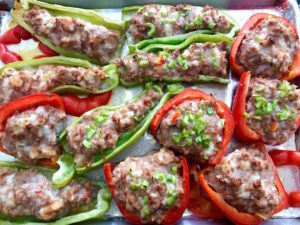 Stuff the peppers with the sausage mixture and set them on a baking sheet (affiliate link). When stuffing the peppers, don’t pack it in. Keep the filling loose which will keep the texture softer after baking. If you pack it in, the texture will be hard. Just mix, stuff, top, sprinkle, and bake. How easy was that? You didn’t have to sauté anything or use a bunch of pans. Heck, you can use a foil baking pan and call it a day! Just know that whichever pan you choose, don’t pack in the peppers. 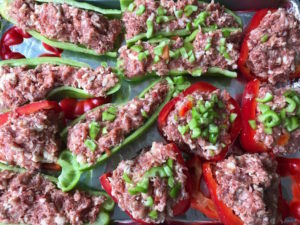 If the stuffed peppers are too snug in the pan, they will take longer to cook. I made this mistake trying to squeeze them all in a baking dish rather than using 2 baking dishes and they took twice as long to cook. I used 6 peppers which were sliced in half. Six halves fit nicely in a 9×13 baking dish or you can fit all on a baking sheet. This recipe is very versatile. 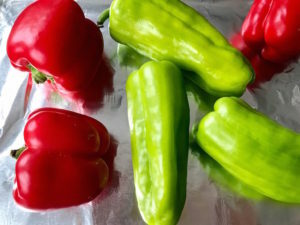 You can use your favorite type of pepper – red, orange, or green bell peppers, or use Italian green peppers. Any leftover sauce can be refrigerated or frozen for another time. 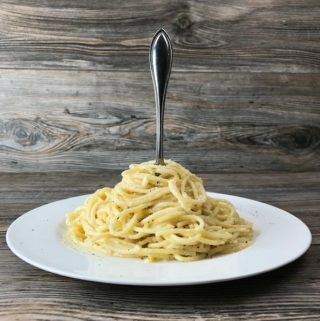 Use as much or as little sauce as you want to top. You can also serve the sauce on the side. 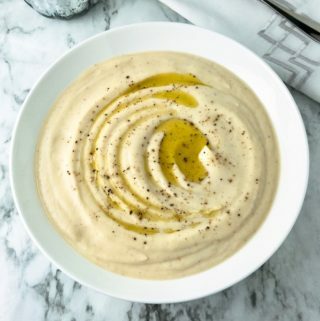 Serve with a salad and some good crusty bread and you have an incredible simple meal. I often pair it with my simple risotto. 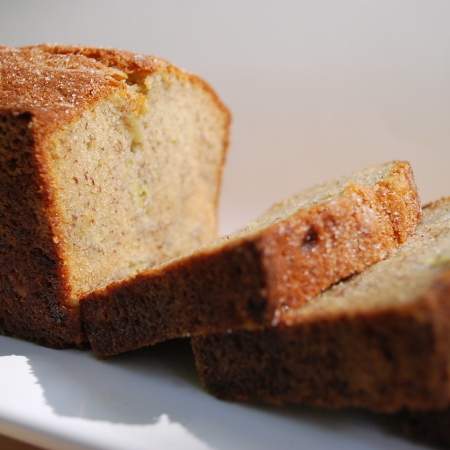 This recipe can be halved or doubled to fit your needs. 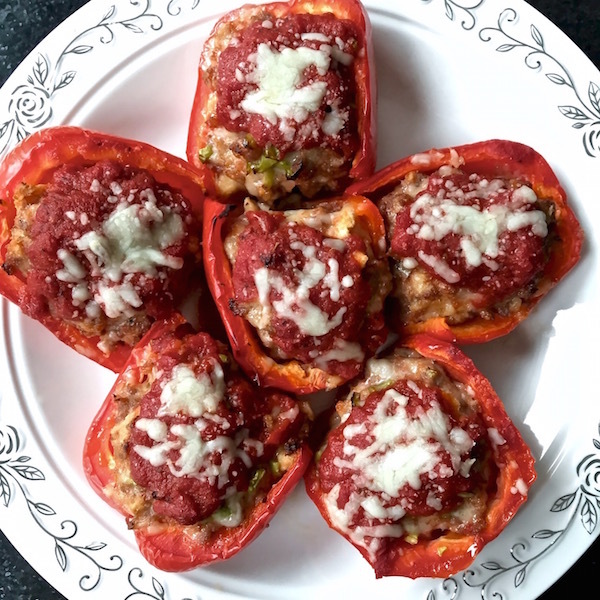 Stuffed Peppers with Sausage and Mozzarella is a hearty delicious meal yet requires little effort to prepare. Mix the ingredients in the bowl, stuff the peppers, top with sauce, sprinkle with cheese, bake, and serve. Part of my KISS recipes - Keep It Short Simple. 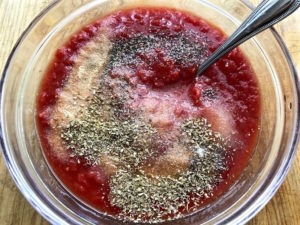 Combine the ingredients for the No Cook Tomato Sauce together in a bowl. Break up the bread and place in a bowl. Drizzle the milk over the bread to moisten. Next, slice the tops off the peppers and cut each pepper in half lengthwise. Scoop out the seeds and pull off the white ribs. Don't discard tops. Cut around the stem and discard stem. Place tops on baking dish and they will soften when cooked. You could also chop the tops and sprinkle on top of stuffed peppers for some added texture. Break up the bread getting rid of any big clumps. I use my hand since I'm going to also use it to combine sausage mixture. 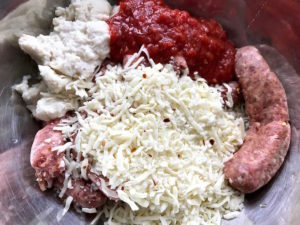 In a large bowl, combine sausage, mozzarella, soaked bread, sauce, and crushed red pepper, if using. Line a baking sheet with foil and drizzle with some olive oil. Stuff the peppers loosely with the sausage mixture, dividing the mixture evenly, and set them on the baking dish. If you chopped the pepper tops, sprinkle them on top of peppers. Drizzle tops of peppers with some olive oil. Bake for 30 minutes then drizzle with some sauce and top with mozzarella. Bake for 15 more minutes. 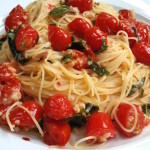 Serve with salad and some crusty bread or with your favorite side. 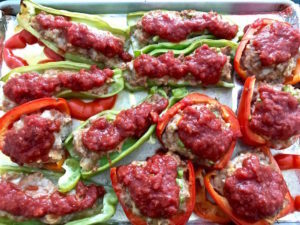 ¼ cup bread crumbs can be used instead of Italian bread Recipe for the peppers can easily be halved or doubled. There's a lot of forgiveness in preparing the stuffing. Use as much or as little sauce for topping. Warmup up any leftover sauce and serve with peppers, if desired. Otherwise, they are perfect as is. After baking, there will be liquid from the peppers on the bottom.